With no high-speed internet, DRM-free is really handy. 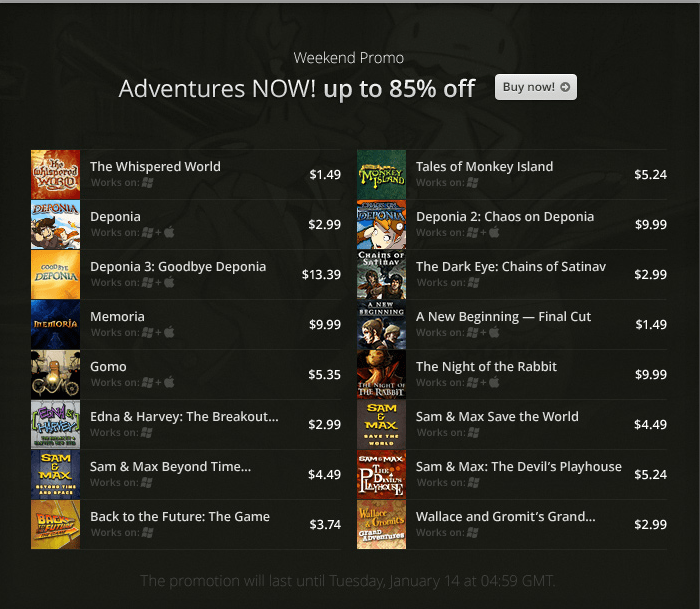 I like GOG.com, but I have most of the games on this list, so I won’t be participating in this sale. Of particular interest are the Sam & Max games from Telltale. I’ve already said my piece about the first one (and plan to review the others too), but I did mention that the games are not worth $30. Well, now’s a good time to pick them up. $4.49’s a perfect price for these games. Actually, all of Telltale’s games are worth playing. I can’t image that Wallace and Gromit’s Grand Adventures (the most maligned of the bunch) is so bad that it’s not worth $3. Click here to go straight to the sale’s webpage.